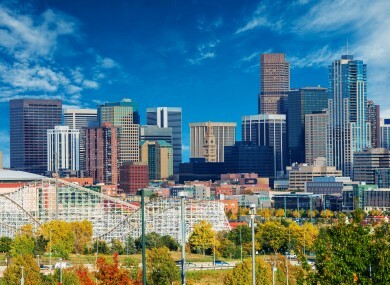 A view of the Denver skyline. A GLASS OF wine with dinner? How about a joint? Denver voters have approved a first-in-the-nation law allowing willing bars and restaurants to give patrons the option to use marijuana alongside a cocktail or meal. The catch: smoking pot won’t be allowed inside, and the locations would have to first get the approval of neighbours. “It’s the sensible thing to do,” said Emmett Reistroffer, a Denver marijuana consultant and campaign manager for the pot-in-bars measure. First, interested bars and restaurants would have to show they have neighbourhood support before getting a license to allow marijuana use. In addition, patrons would have to bring their own weed to comply with a state law banning the sale of both pot and food or drink at a single location. Patrons at participating bars could use pot inside as long as it isn’t smoked. The law does provide for the possibility of outside smoking areas under restrictive circumstances. The law also allows for non-service establishments, such as yoga galleries or art galleries, to set up pot-smoking areas or hold events serving both pot and food and drink. Mason Tvert, a spokesman for the national Marijuana Policy Project and a Denver proponent of the consumption law, said the measure would reduce instances of tourists smoking pot on footpaths and in parks because they have nowhere private to consume weed. Supporters of the measure had no guess on how many establishments would apply for the permits or how long it would take for them to demonstrate community acceptance and receive permits. So it could take many months before Denver sees any Amsterdam-style coffee shops. The measure runs out in 2020, unless city officials renew the licenses or voters make the pot-in-bars measure permanent. Current Colorado law allows jurisdictions to decide for themselves when pot could be used in public. The result is a hotchpotch of local laws related to marijuana clubs. California’s recreational marijuana measure approved last week allows pot clubs, and legalisation measures approved in Massachusetts, Maine and Nevada don’t rule out on-site pot consumption on private property. Opponents of the Denver measure predicted neighbourhoods would resist bars, restaurants and other venues seeking pot licenses. They warned the measure won’t properly protect the public from stoned patrons leaving a bar that allows smoking and drinking at the same time. “How can these businesses possibly monitor patrons for marijuana intoxication?” opponent Rachel O’Bryan said in a statement this week. The measure would require any interested bar or restaurant to specially train staff in marijuana use and submit an operations plan to show how it would prevent marijuana use by underage patrons. Applicants must also specify strategies and procedures for identifying and responding to the potential over-intoxication of consumers. Email “Here’s what it’s like in the first US city to allow marijuana to be smoked socially”. Feedback on “Here’s what it’s like in the first US city to allow marijuana to be smoked socially”.